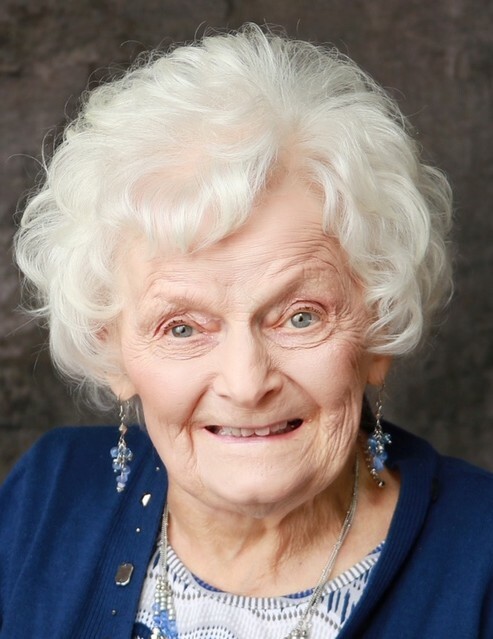 Obituary for Ilene Lucile Anderson | Cromes-Edwards Funeral Home & Crematory, Inc.
Ilene Lucile (Wakefield) Anderson was born on January 25, 1923, to Esther Marie (Griffin) and Basil Arnum Wakefield. She passed away on October 31, 2018, at Miami Valley Hospital in Dayton OH, following a series of unfortunate events leading up to her death. She was raised near the Twin Butte’s, west of Butte, NE, on land homesteaded by her great-grandfather, George Washington Clay Gillespsie. The original stone home is still on the property. As a girl, Ilene loved to attend school, as well as work on her grandfather, (John Alfred Griffin’s), farm. She loved their horses, especially her horse, Flory. Ilene attended a country school in early years, and also Anoka and Butte schools in later years, all in Nebraska. She graduated from Butte High School, and went on to earn her Bachelor’s Degree for Elementary Education and attended the University of South Dakota at Springfield, and Wayne State College, Wayne, NE, while raising her family. She taught for 40 years. Ilene loved to write poetry since her childhood, and the family cherishes her writings to this day. Her career began with teaching in country schools in Nebraska and South Dakota. She also taught public schools in Bristow and Butte, Nebraska; also Fairfax, Bonesteel, Burke and Gregory, South Dakota. Her last few years of teaching were at the Word of Life Christian School in O’Neill. She treasured receiving the many loving notes and gifts from her students over the years. She spent many hours decorating her school rooms and bulletin boards. Ilene was married to Garlen Anderson on August 11, 1954. To this union, three children were born: RandyAnderson, DeMaris (Dee) Anderson Waters, and Troy Anderson. Ilene resided in Butte, NE, while raising her family. In later years she and Garlen lived in Farmington NM, where their son, Troy and family lived. She then moved to Kearney NE, following the death of her husband, also near son, Randy. Later on, she moved to Sidney OH, to live near her daughter, DeMaris (Dee). Ilene attended Northtowne Church of God and was a resident of “The Pavilion”, both of Sidney. She enjoyed meeting people and was a “ray of light” to anyone who knew her. Her caring heart and sense of humor were a winning combination. Ilene was a wonderful wife, mother, grandmother, great-grand mother, sister, aunt, teacher, and friend to all whoknew her. She was very unselfish and caring, and put others’ needs ahead of her own. She had a beautiful alto voice, and her children can recall her dancing through the house singing as her husband, Garlen, played the organ. Ilene loved to hear her children and grand children sing and play instruments; it was a joy to her heart. She loved to attend church with them. She could be found throughout the day kneeling to pray to the Lord and for her loved ones. Her children also recall the many times she would kneel and pray early in the morning and at bedtime. Ilene was always busy, and never idle. When she wasn’t teaching, she was providing meals on site for Garlen and their sons, Randy and Troy, as they worked in a family business, Anderson & Sons’ Construction. She loved accompanying them when they went hunting, fishing, and golfing. She enjoyed time with DeMaris at home doing special projects, cooking, shopping, and attending ladies’ministries events. Ilene was Women’s Ministries President at the Butte Full Gospel Church, and also hosted ladies “Prayer & Share” events in her home to encourage one another and study the Bible. Ilene had a heart and a vision for the Lord. She took special note of those less fortunate and would deliver food and clothing to them whenever she could. Survivors include her son, Randy (Holly) Anderson of Springview, NE, daughter, DeMaris/Dee (Ben) Waters of Sidney, OH, and 7 grandchildren, 12 great-grand children, nieces, nephews, and a multitude of friends. She was preceded in death by her husband, Garlen; premature infant daughter, Julie; son, Troy; her parents, Basil and Esther Wakefield; step-father William (Bill) Edwards; and siblings Elva Davis, Leonard Wakefield, and Jeannie Pfeffer. Funeral arrangements included Cromes-Edwards Funeral Home of Sidney OH, and Brockhaus Funeral Home of Spencer, NE. Services were held Monday, November 5th, at Full Gospel Church in Butte, NE, with burial at the Butte City Cemetery. Pastors’ Roger Wendt, Tim Hazen, and Tyler Wilterding officiated. Ilene’s family provided the music.